A couple of months ago, as I was starting to pull together the vendors for the pre-Rhinebeck Trunk Show, I was thinking about how I needed to get a banner and whether I should try out VistaPrint, when this crazy idea came to me somewhere around 1 in the morning (yes, I tend to be a night owl). 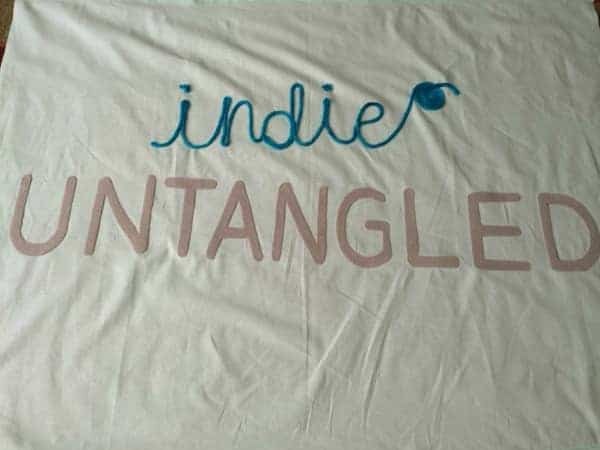 I had actually seen twine used to spell out Home Depot when I’d taken a trip there for dishwasher shopping, and I realized there was an opportunity to bring the Indie Untangled logo to life. 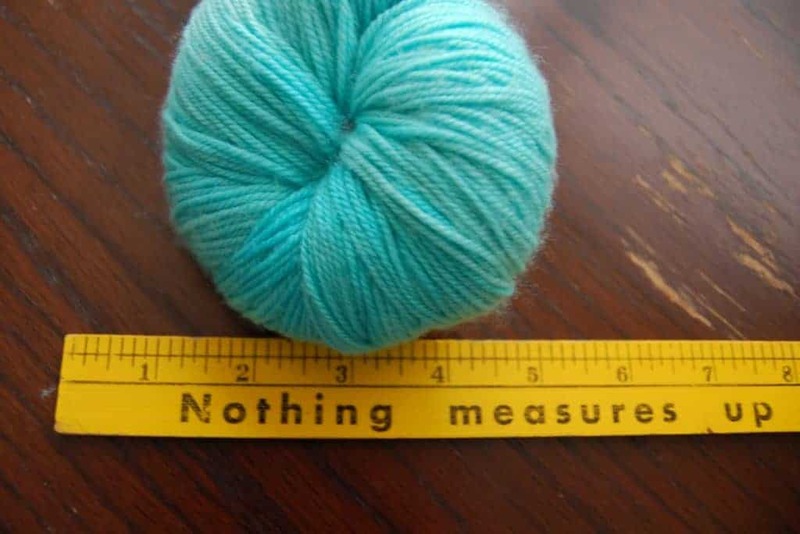 So, I contacted Michelle of Berry Colorful Yarnings, and she kindly sent me a skein of her chunkiest yarn in the Indie blue that she had dyed up for the giveaway we did a few months ago. I found some lovely aqua quilting cotton on Hawthorne Threads, where I also got the accent fabric for the yarn ball bags (and let me just say, if I was more adept at using my sewing machine, that site would get me in a lot of trouble). I decided that this would be one of my projects for the Time for Harvest Craft-along that A Playful Day is doing on Ravelry and social media. Last week, I blew up the letters of my logo using a combination of PicMonkey and Microsoft Word. I cut them out, traced them on some card stock, and then cut them out again. 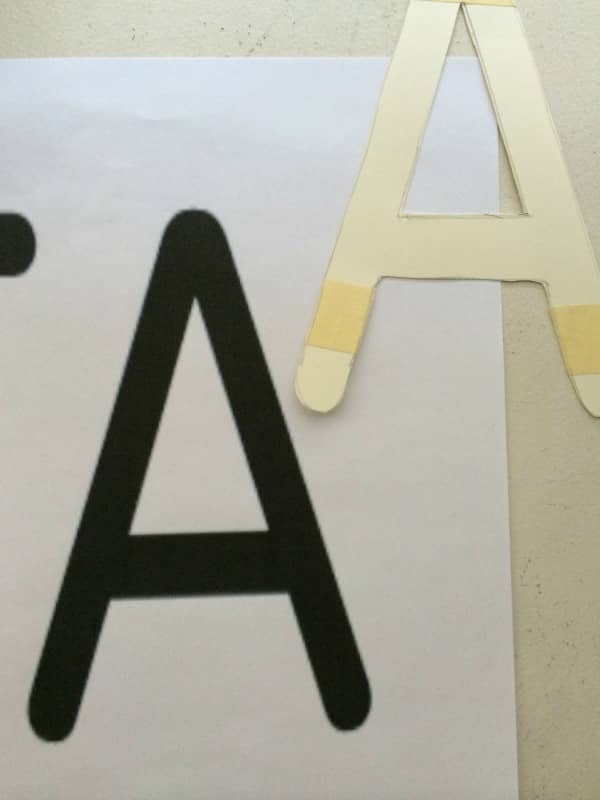 Then, I cut around my card stock stencil to make the letters in grey felt. My mom came over this past weekend to help, and we hauled out the sewing machine she had gotten me for Chanukah something like four years ago (eep!). 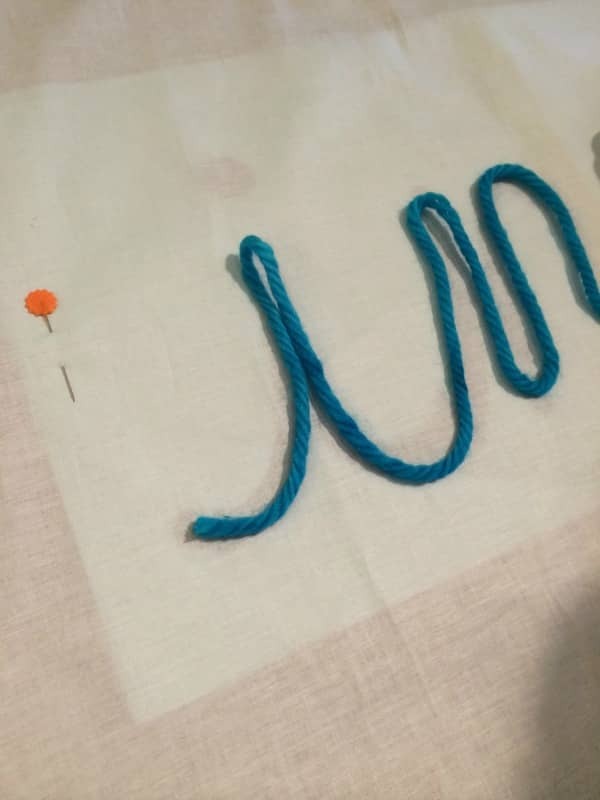 I got a refresher in winding the bobbin and threading the machine, and she generously helped me hem the cut sides of the fabric and create a small tube at the top so I can thread through yarn or string to hang it. 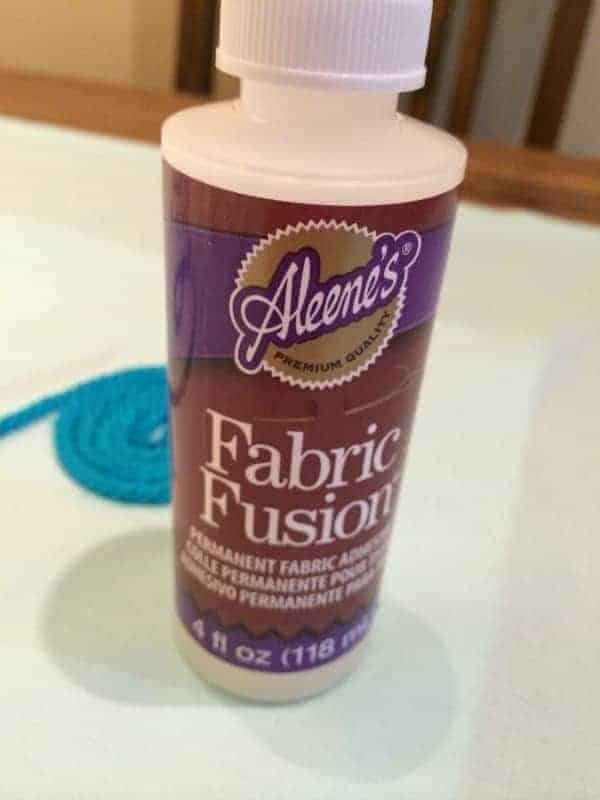 I also picked up some fabric glue, since I figured my hot glue gun wasn’t the best idea for this material. 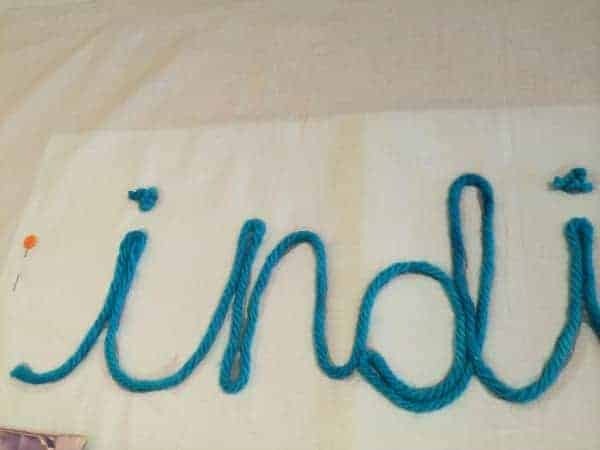 It was also a lot easier to position the yarn and the letters without having to worry about the glue drying right away. 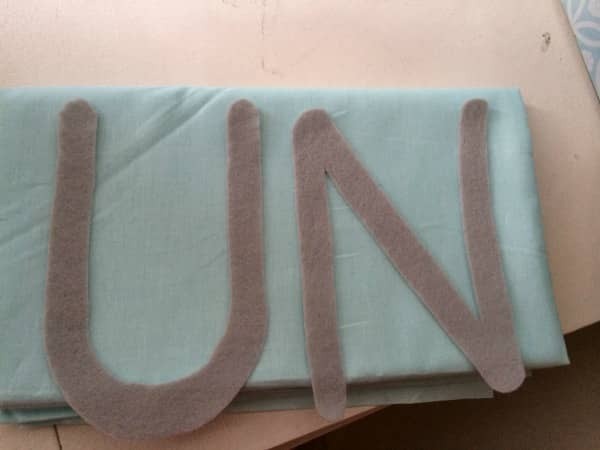 I also blew up the script Indie, put the paper underneath and just followed the letters with the glue before laying down the yarn. I set it out on the dining room table to dry for a few hours, and that was it! (I also text my husband, “Take a look at banner, Mitchell!” which you Arrested Development fans will appreciate.) It’s currently draped over one of my snack tables, and I’m trying to figure out how best to store it before the show. Maybe I’ll pick up a mailing tube of some sort and wrap it around. Of course, I could have used VistaPrint or my local Staples to print out a banner very easily and inexpensively, but I really enjoyed the opportunity to do some non-knitting crafting. This entry was posted in Crafting and tagged CAL, rhinebeck trunk show, yarn. This is lovely and 100% more interesting than a printed banner! I love the fact that it’s 3 dimensional. That you made it yourself really embraces the whole “indie untangled” concept. It’s lovely! Proudly wave it at your booth! I love it – far truer to the spirit of the endeavour than a print banner! !